Growth Street provides secured lending facilities to UK businesses to help them with short term cash flow demands. Businesses borrowing through their ‘GrowthLine’ product pay a representative APR of 11% whilst lenders hope to earn 6.4% AER. Growth Street also offers to help businesses through its cash flow management and forecasting tool ‘Business Insights’. 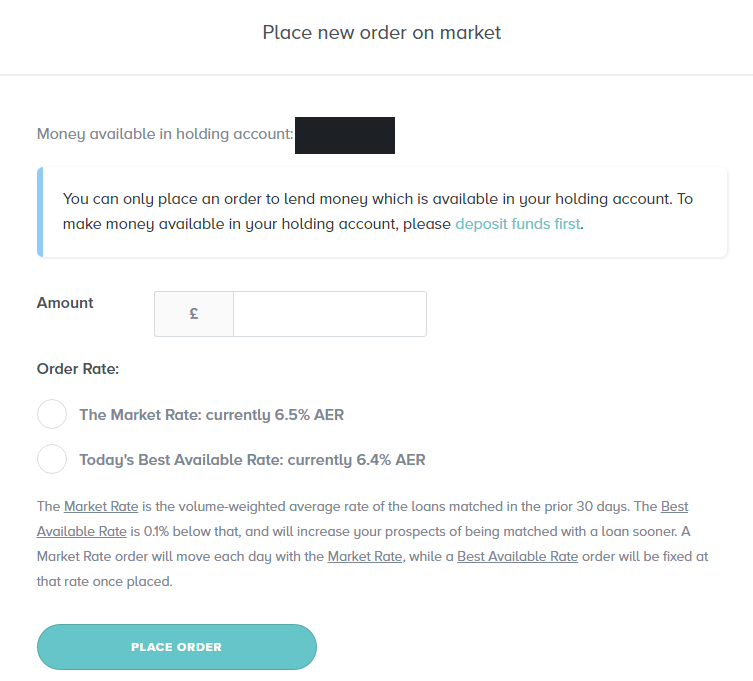 For me, Growth Street’s lending product is not quite as easy to get your head around as other platforms. They describe it as ‘a combination of a revolving credit facility (also called an overdraft alternative) and invoice financing’. From a lender’s perspective, loan terms are all 30 days and protected by a provision fund. Sell Out: No early sell out, but loans are 30 day terms only. I first heard about Growth Street last September. Attracted by a potential 10% cashback on £1,000 and the chance to diversify my P2x lending, I registered straight away. However at this time they were only open for LTD and LLPs so I was put on a waiting list until they began to open it up to private investors. I’ve noticed that all of the platforms which offer some sort of invoice financing product have very high barriers to entry. For example, Market Invoice and Platform Black both have a minimum investment of £50,000. So, perhaps there are some additional FCA regulatory hoops to jump through for these types of lending platforms? A profitable SME with a growing working capital need. This is often due to the payment terms with their business customers, so our most common borrowers are wholesalers, professional services, and manufacturing businesses. From looking through the borrower FAQ’s on the website, they appear to assess potential borrowers through a phone interview, by requesting a recent bank account statement, cash flow forecasts and even requiring access to their accounting software. The rate borrowers pay is semi-flexible: an interest rate applied on a daily basis plus a 0.4%+VAT charge on the peak of the previous month. To give a borrower’s example from a professional services background, say you are a small consultancy with a few large FTSE 100 clients. Your clients have high credit ratings and love the work you do, but use their relative bargaining power to push payment terms as far as they can. You have value held up in money you are owed from these clients but need short term cash to take on more staff to keep growing. If Growth Street are able to understand this risk through their approval process they can offer you an attractive short term rate at relatively low risk. It is easy to see how this also appeals to wholesalers buying products in bulk or manufacturers looking to scale. 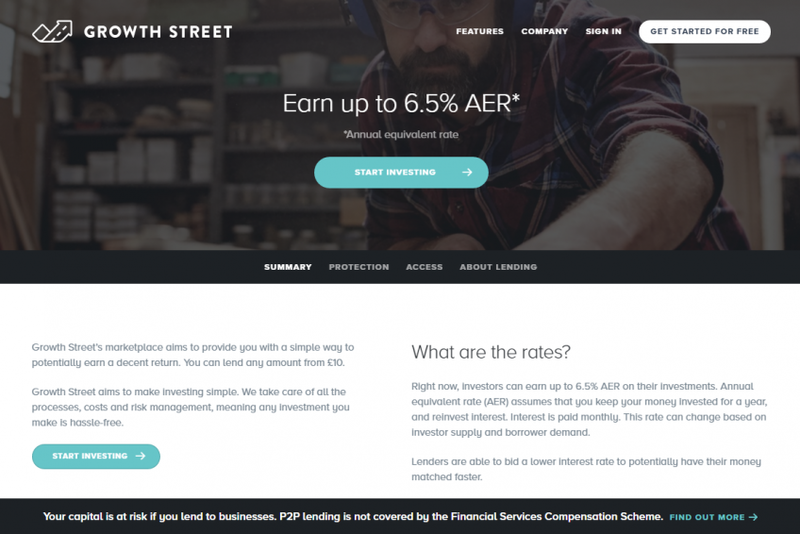 Growth Street advertise an AER (annual equivalent rate) of 6.5% assuming that you keep your money invested for a year and reinvest the monthly interest payments. Since loan terms are all 30 days, the cash drag (the time it takes to get funds invested) is important. 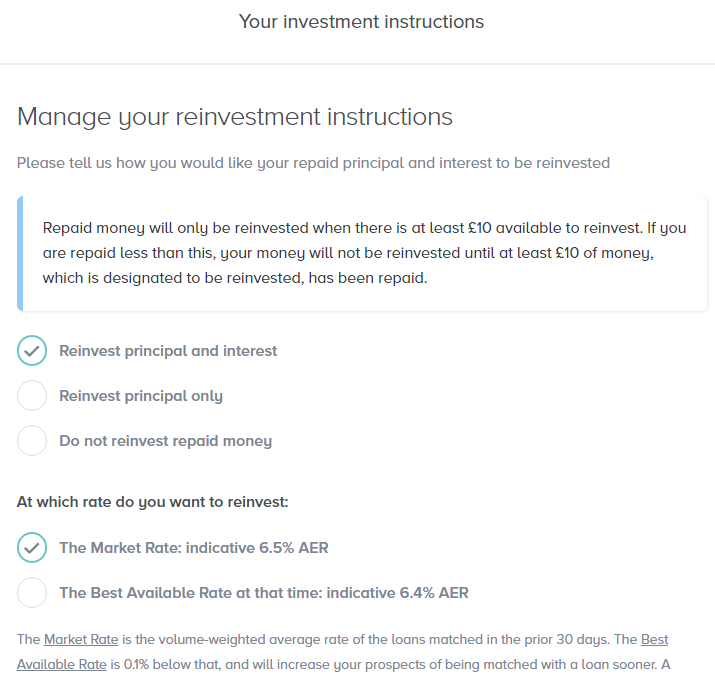 If Growth Street can reinvest your funds on the same day they pay back then the AER will match the target rate once you are invested, but if reinvesting has a longer delay it will reduce the returns a little. So far for me, funds have been reinvested on the same day with no delay. Every Growth Street loan is secured. We typically take first- or second-ranking fixed and floating charges over all business assets. Alternatively, we take fixed charges over book debts relating to specific invoices. As the loan terms are relatively short, I’d also like to think that Growth Street would have a faster feedback loop to identify which businesses defaulted and to improve their lending criteria. You deposit new funds via a bank transfer. I made my deposit at 6pm on a Friday evening (probably the worst possible time) and it was received into my investment account by 9am the next morning. As I mentioned above, although the 0.1% difference between 6.4% and 6.5% may not seem significant, as the loan terms are all 30 days this becomes more important in the long term. 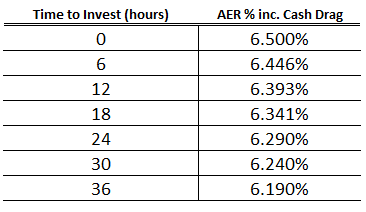 Using the same logic as with the lending speed AER% above, I calculate if the difference in lending speed between the two options is more than 11 hours, you are better off lending at the lower 6.4% rate over the course of a year. I invested £1,000 at 6.5%, which was fully invested within 24 hours (I had no email to confirm the exact time). As this was on a Saturday/Sunday I was quite impressed by the lending speed. When I looked into the loan contract itself the interest rate was given as 6.31%, this is the nominal rate that compounds up to a 6.5% AER once you reinvest all earnings every 30 days. Update 4th January: My first 30 day term finished yesterday and I was interested to see how long it would take to get the money reinvested: any significant delay would cut into returns. The loan repaid and was reinvested in the same day, which was good news! With a reasonable reinvestment speed I’m expecting my basic return to work out around 6.3% over the year. Growth Street does not appear to be a bootstrapping startup, but seems very well funded and actively recruiting to grow (I see 5 job postings on workable.com as I write this). As for risk, I plan to keep an eye on the provision fund coverage ratio and keep my P2P lending pot spread out among several platforms and investment types. You are an active investor in Growth Street or have been in the last 6 months. Any indication how long the bonus will be available? Currently looks like an opportunity to diversify in to a different area of lending. With p2p the more diversified the better is my feeling. Hi Shaun, the terms currently say “You must sign up before 1 January 2017 to be eligible for the bonus”. I am not sure if this is just a short term offer they are running to get investors onboard as they open up to retail investors, or if it’s more like Funding Circle where they continually extend the welcome bonus end date every couple of months. Thanks, I had missed the 1st Jan date. I tried joining today, and it said that they cannot allow anyone to join, as they have a strict criteria for choosing investors. This was something new to me as other P2P platforms aren’t so picky. Just wondering if you or anyone else has had a similar experience. Hi Neil, thanks so much for the reviews. A question about your cash drag calculation. Do Growth Street indicate that they have continuous (or at least hourly) compounding? I mean does it matter if the interest/repayment etc. are invested 2 hours or 5 hours after they are received? I would assume most sites would use an end of day cutoff to determine what money to pay interest on. It’s end of day and the calculation I have above is too simple. When I first invested I expected to have about 6.3% after drag, but in practice now after a few months it’s been 6.4% (including the day wasted transferring from my bank account after working hours). I recently invested in Growth Street, but not had any matches in nearly two weeks yet. Is this normal in anyones experience? From what I can see as an investor, the last month or so has seen the rates fall really quickly (I guess a miss-match between huge investor supply and lower borrower demand). So in my case, I’ve set my investment to go at the priority rate, but then the market has dropped further and my rate has stayed the same (and hence doesn’t get matched). I am having to log in to check the priority rate hasn’t dropped, and if it does then I cancel my bid and remake it at the lower rate. I hope this is just a temporary thing while they source new borrowers. It is not normal, in the past I would get a match within the same (or next) day. Bonus £200 on £5000 investment. Paid after 1 year if you have £5000 fully invested (or waiting to be invested) for 1 year. Can take out interest payments.